French general, Marshal of France, Great Britain and Poland and the Supreme Allied Commander during the final year of the First World War. Album page signed “F. Foch” and dated in his hand. 1p., 5.0 x 3.0 inch, n.p., September 1919. Signed and dated in dark black ink. 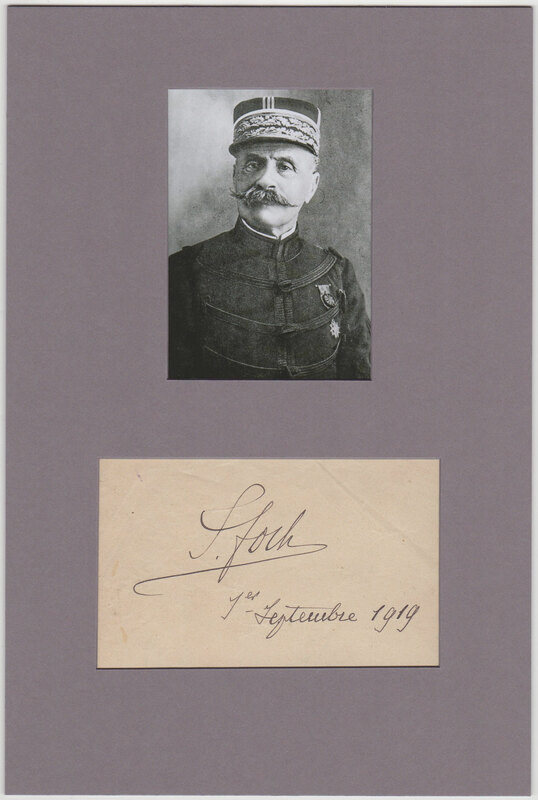 Handsomely matted in gray with a photograph of Foch to an overall of 7.75 x 11.75 inch. Both items removable affixed with photo corners. Album page has minor handling wear, else fine condition. King of Prussia from 1740 until his death. His political prowess and enlightened attitudes toward religion, learning, and the humanities earned him the sobriquet “Frederick the Great”. Autographed note signed “Federic”. 1p. (double-page), 7.25 x 9.0 inch, n.p., n.d. Letter of Henry IX. Reuss, Count of Köstritz addressed to the King. 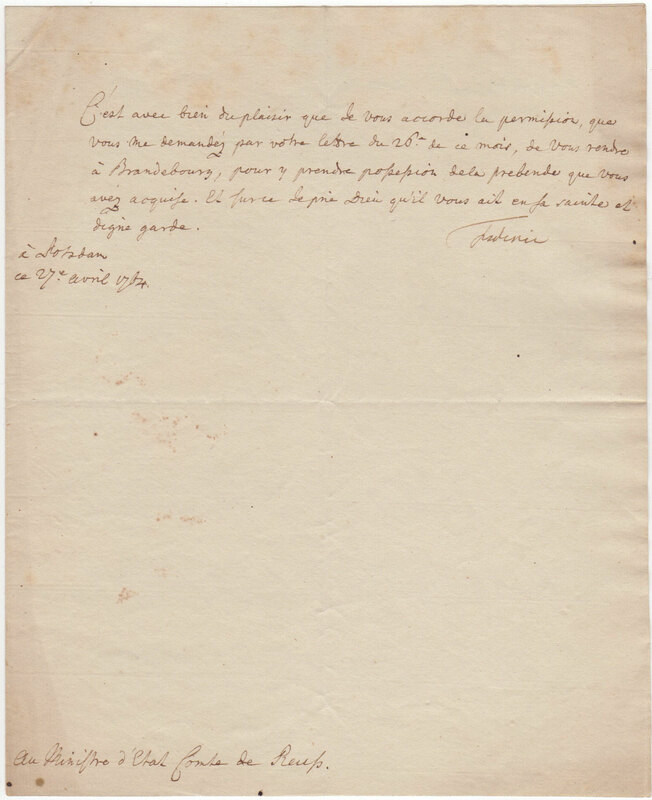 A letter written by the Count of Köstritz regarding the purchase of two pictures, where the dealers had pushed the prices higher and higher and Count Reuss had offered not only 6000. (écûs), but also „Cent Louis“ for each related frame. At the end of the letter the King added a fine four-line autographed note signed in French, in full: “je n’ai pas bessoin des Cadres j’en ai de reste, je ne pourai finir cette affaire qu’a mon retour de Silesie / Federic”. Mailing folds, slightly discolored, else fine condition. Letters in French usually signed as “Federic” and not “Frederic”, referring to some biographies the King had the opinion that “Federic” sounds better. Handwritten notes of Frederick II. are rare and highly desirable. Henry IX. Reuss, Count of Köstritz (1711-1780) earned a degree in Law and Political Sciences. Through his family connections he met with the future King Frederick II. of Prussia. From 1762 to 1769, he was Royal Prussian Postmaster General and Chief of the postal system. He later rose to become directing minister, top civil servant and close personal advisor to Frederick the Great. King of Prussia from 1740 until his death. His political prowess and enlightened attitudes toward religion, learning, and the humanities earned him the sobriquet “Frederick the Great”. Letter signed “Federic”. 1p. (double-page), 7.5 x 9.0 inch. Berlin, 1748 December 14. To the Count of Köstritz. In French, in parts: “... Vous étes touche des nouvelles preuves que je viens de vous donner de ma bonne volanté les aveux de votre reconnaissance et de votre sensibilite me sont une preuve de votre zele ...” Mailing folds, slightly discolored, else good condition. Henry IX. Reuss, Count of Köstritz (1711-1780) earned a degree in Law and Political Sciences. Through his family connections he met with the future King Frederick II. of Prussia. From 1762 to 1769, he was Royal Prussian Postmaster General and Chief of the postal system. He later rose to become directing minister, top civil servant and close personal advisor to Frederick the Great. King of Prussia from 1740 until his death. His political prowess and enlightened attitudes toward religion, learning, and the humanities earned him the sobriquet “Frederick the Great”. Letter signed “Federic”. 1p. (double-page), 7.5 x 9.0 inch. Potsdam, 1757 October 25. To the Count of Köstritz. In French: “Je vous accorde avec bien ou plaisir la permission que Vous demandes par votre lettre du 23 de mois, de pouvoir aller en Hollande pour arranger la succession qui Vous revient par la mort de feu votre beaupere le cote de Flodroff et Je vous laisse l'entiere liberte d'employer tout le tems qu'il Vous faudra pour faire les arrangemens que Vous ...” Mailing folds, slightly discolored, small stain, else good condition. Henry IX. Reuss, Count of Köstritz (1711-1780) earned a degree in Law and Political Sciences. Through his family connections he met with the future King Frederick II. of Prussia. From 1762 to 1769, he was Royal Prussian Postmaster General and Chief of the postal system. He later rose to become directing minister, top civil servant and close personal advisor to Frederick the Great. King of Prussia from 1740 until his death. His political prowess and enlightened attitudes toward religion, learning, and the humanities earned him the sobriquet “Frederick the Great”. Letter signed “Federic”. 1p., 7.5 x 9.0 inch. Leipzig, 1763 February 15. To the Count of Köstritz regarding a request from Reuss and written on the day of the peace of Hubertusburg, on which Prussia and Austria ended the Seven Years War. In French: “…vous penetreréz aisement, que dans ces moments, où tant d’autres aiffaires de consequence m’occupent, Je ne saurois point me distraire par d’autres arrangements qui regardent l’interieur de Mon païs, ainsi qu’il faut que vous prenniéz patience puisquà ce que Je serai de retour à Berlin, et que J’aurai le loisir d’arranger tou ceci…” Mailing folds, slightly discolored, small hole, else good condition. Henry IX. Reuss, Count of Köstritz (1711-1780) earned a degree in Law and Political Sciences. Through his family connections he met with the future King Frederick II. of Prussia. From 1762 to 1769, he was Royal Prussian Postmaster General and Chief of the postal system. He later rose to become directing minister, top civil servant and close personal advisor to Frederick the Great. King of Prussia from 1740 until his death. His political prowess and enlightened attitudes toward religion, learning, and the humanities earned him the sobriquet “Frederick the Great”. Letter signed “Federic”. 1p. (double-page), 7.25 x 9.0 inch. Potsdam, 1764 April 27. To the Count of Köstritz. In French: “C'est avec bien du plaisier que de vous accorde la permission, que vous me demandez par votre letter de 26 de ce mois, de vous rendre a Brandenbourg, pour y prendre possession de la prebende que vous avez acquise.” Mailing folds, handling wear, else good condition. Henry IX. Reuss, Count of Köstritz (1711-1780) earned a degree in Law and Political Sciences. Through his family connections he met with the future King Frederick II. of Prussia. From 1762 to 1769, he was Royal Prussian Postmaster General and Chief of the postal system. He later rose to become directing minister, top civil servant and close personal advisor to Frederick the Great. King of Prussia from 1740 until his death. His political prowess and enlightened attitudes toward religion, learning, and the humanities earned him the sobriquet “Frederick the Great”. 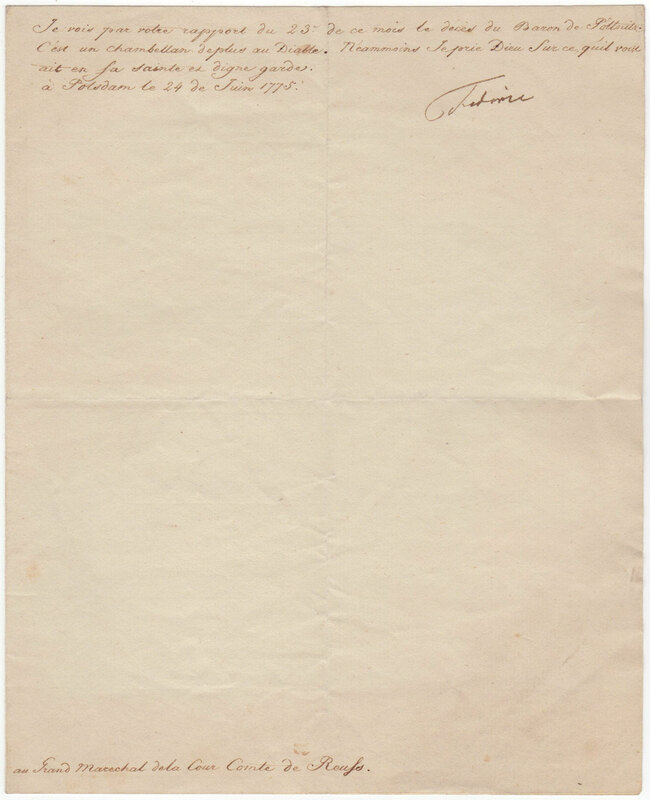 Letter signed “Friedrich”. 1p. (double-page), 7.5 x 9.0 inch. Berlin, 1764 August 18. To the Count of Köstritz regarding a receipt over “1.000. Stück Fried d'or” (currency) for Count v. Reuss (Quittung über 1.000. Stück Fried. d´or für den Grafen v. Reuss). In German: “Se. (ine) Königl. Majestät in Preußen haben allergnädigsten… bescheinigen Friedung den richtigen Empfang … jenigen für Tausend Stück neuen Friederichs d´or, so den Grafen v. Reuss zu höchst derselben … Gründen … abschließend Zeit.” Mailing folds, slightly discolored, else good condition. Henry IX. Reuss, Count of Köstritz (1711-1780) earned a degree in Law and Political Sciences. Through his family connections he met with the future King Frederick II. of Prussia. From 1762 to 1769, he was Royal Prussian Postmaster General and Chief of the postal system. He later rose to become directing minister, top civil servant and close personal advisor to Frederick the Great. King of Prussia from 1740 until his death. His political prowess and enlightened attitudes toward religion, learning, and the humanities earned him the sobriquet “Frederick the Great”. Letter signed “Federic”. 1p. (double-page), 7.25 x 9.0 inch. Potsdam, 1775 June 24. To the Count of Köstritz. In French: “Je vous par votre rapport de 23 de ce mois le deces de Baron de Pöttnitz c'est un chambellan deplus au Diable.” Mailing folds, else good condition. Henry IX. Reuss, Count of Köstritz (1711-1780) earned a degree in Law and Political Sciences. Through his family connections he met with the future King Frederick II. of Prussia. From 1762 to 1769, he was Royal Prussian Postmaster General and Chief of the postal system. He later rose to become directing minister, top civil servant and close personal advisor to Frederick the Great. Prominent German politician of the NSDAP, who served as Reich Minister of the Interior in the Hitler Cabinet from 1933 to 1943. After World War II. he was tried and convicted of war crimes at the Nuremberg Trials and executed by hanging. Signed photograph “Frick”. 3.5 x 5.5 inch, n.p., n.d., signed in dark ink. Photo by Photo Hoffmann, Munich. Slightly discolored, handling wear, else good condition. Note: We reject Nazism in any form! 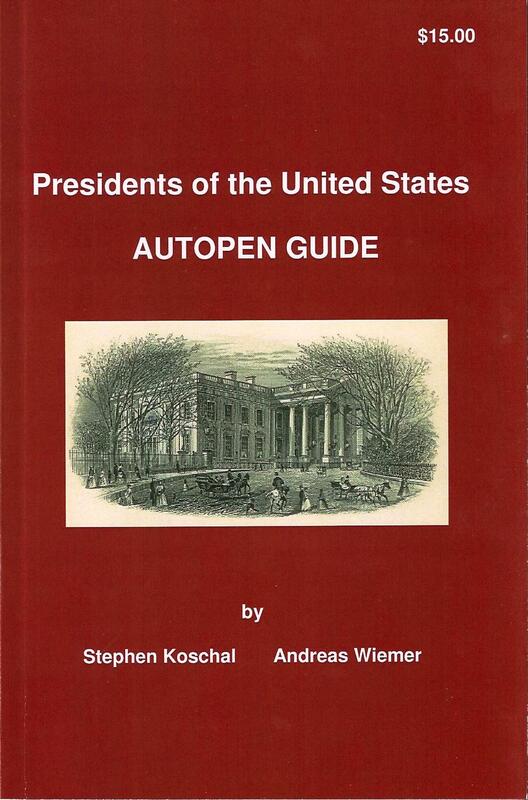 Nevertheless we offer autographs of this kind, because it is an important part of the history of the 20th Century. To the extent applicable to those affected by German law, particularly § 86a StGB, historical and military items from or relating to the period and personalities of the German Third Reich are offered for only purposes of education and research regarding historical events and military history. Clients who purchase such items agree that they will not use them for propaganda or other purposes that would be punishable under § 86a StGB. Italian general, politician and nationalist who played a large role in the history of Italy and considered one of the greatest generals of modern times. Autographed letter signed “G. Garibaldi”. 1p., 8.0 x 10.0 inch, Caprera 1865 March 25. Addressed to Mr. James Howard. In English, in full: “I should most assuredly have replied to your letters if I had received them, for I shall never forget the kind welcome that I received at your magnificent establishment, and from your dear family. One of your ordinary ploughs I will accept with gratitude, but for a steam plough land would not be found suitable at Caprera. I therefore thank you and your fine workmen with all my heart for your generous offer. I prefer to address my letter to you in England, and I beg you to present my most affectionate wishes to your amiable family. I am – for life – your devotedly. I believe that we saluted the Ripon on your passage. Remember me kindly to Capt. Rogers when you see him.” Mailing folds, minor fold breaks expertly repaired, else good condition. French general and statesman who led the Free French Forces during World War II. He later founded the French Fifth Republic in 1958 and served as its first president from 1959 to 1969. 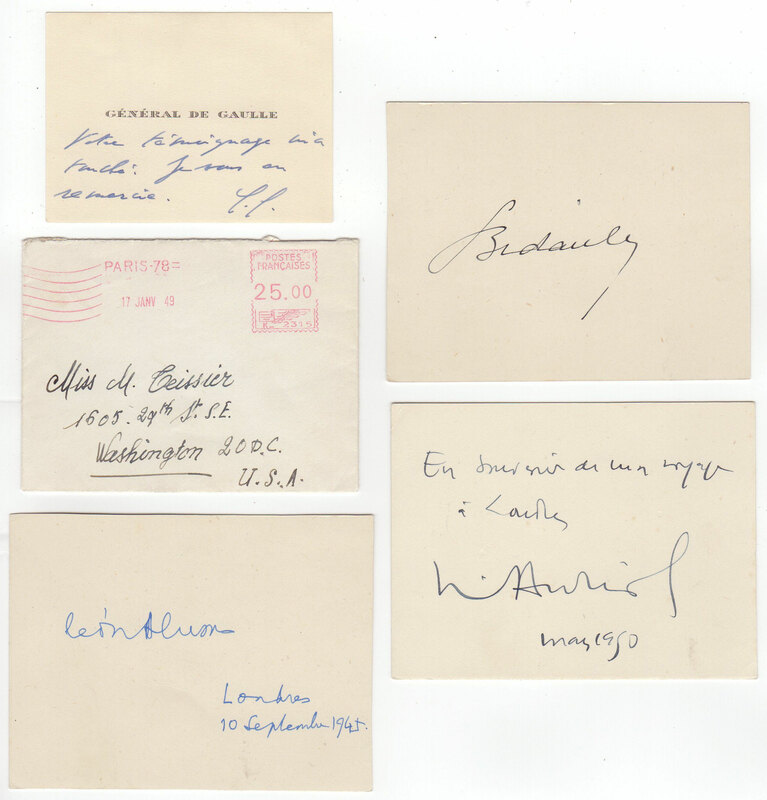 Card signed “C.G.” and additional salutation in de Gaulle’s hand. 3.25 x 2.5 inch, Paris January 17, 1949. Together with the original mailing envelope. Also included is a card signed by the first President of the fourth French republic Vincent Auriol (1884-1966), Prime Minister Leon Blum (1872-1950) and Prime Minister Georges Bidault (1899-1983). Fine condition. German politician, military leader and leading member of the Nazi Party (NSDAP). Emmy Göring -German actress and the second wife of Luftwaffe Commander-in-Chief Hermann Göring. She served as Adolf Hitler's hostess at many state functions and thereby staked a claim to the title of "First Lady of the Third Reich". Signed photograph “Göring” by Herman Göring and additional signed “Emmy Göring” by Emmy Göring. Postcard photograph (Film, Foto Verlag, Berlin), 4.25 x 6.0 inch, n.p., n.d., black and white image of Arno Breker’s work “Berufung” (1941). Signed in dark ink by Hermann and Emmy Göring. Excellent condition, rare signed by both. Arno Breker (1900-1991) was a German architect and sculptor who is best known for his public works in Nazi Germany. Note: We reject Nazism in any form! Nevertheless we offer autographs of this kind, because it is an important part of the history of the 20th Century. To the extent applicable to those affected by German law, particularly § 86a StGB, historical and military items from or relating to the period and personalities of the German Third Reich are offered for only purposes of education and research regarding historical events and military history. Clients who purchase such items agree that they will not use them for propaganda or other purposes that would be punishable under § 86a StGB. German politician, military leader and leading member of the Nazi Party (NSDAP). 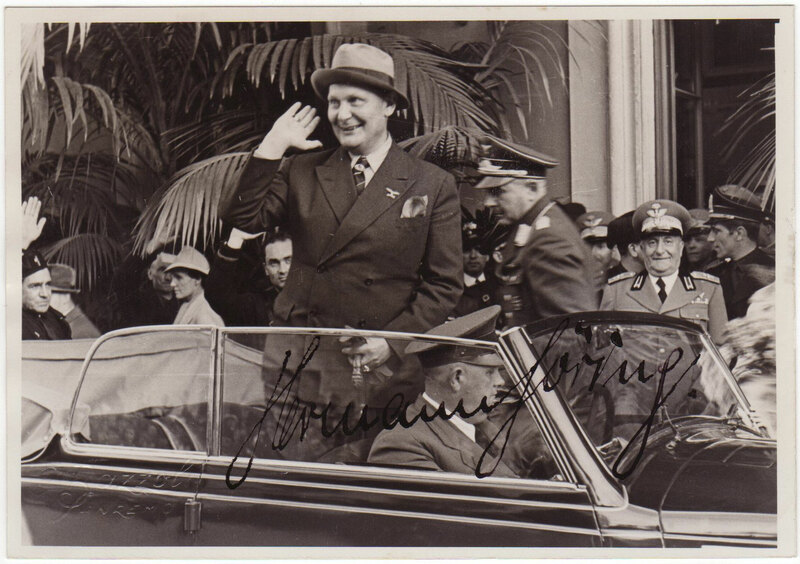 Signed photograph “Göring”. 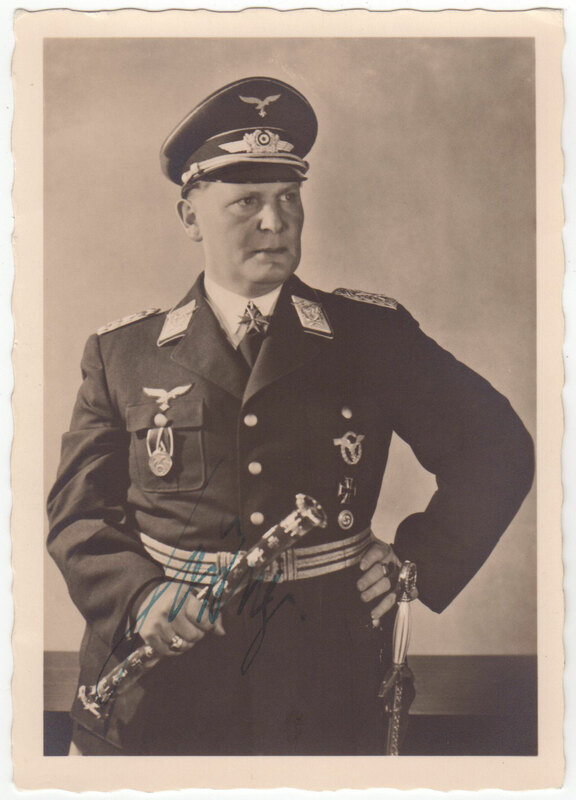 4.25 x 6.0 inch, black and white photograph of Göring in uniform, signed in blue ink. Photo Hoffmann, Munich printed on verso. Fine condition. Note: We reject Nazism in any form! Nevertheless we offer autographs of this kind, because it is an important part of the history of the 20th Century. To the extent applicable to those affected by German law, particularly § 86a StGB, historical and military items from or relating to the period and personalities of the German Third Reich are offered for only purposes of education and research regarding historical events and military history. Clients who purchase such items agree that they will not use them for propaganda or other purposes that would be punishable under § 86a StGB. German politician, military leader and leading member of the Nazi Party (NSDAP). Signed photograph “Hermann Göring”. 6.0 x 4.25 inch, black and white photograph of a smiling Göring, signed in black ink. Photo by Bazzoli, San Remo, blind embossed in lower left edge. Fine condition. Note: We reject Nazism in any form! 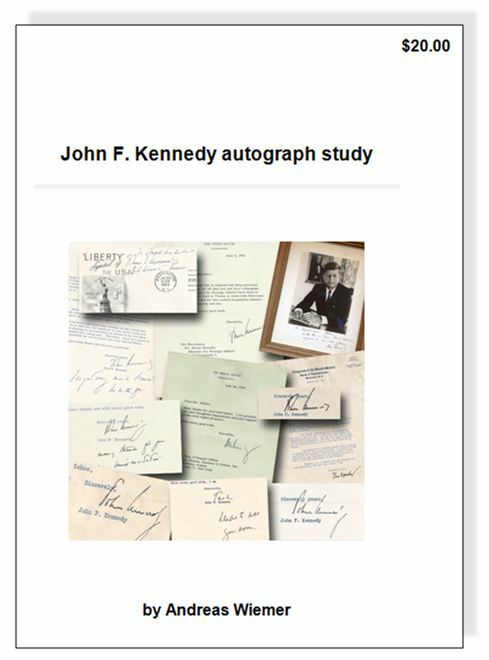 Nevertheless we offer autographs of this kind, because it is an important part of the history of the 20th Century. To the extent applicable to those affected by German law, particularly § 86a StGB, historical and military items from or relating to the period and personalities of the German Third Reich are offered for only purposes of education and research regarding historical events and military history. Clients who purchase such items agree that they will not use them for propaganda or other purposes that would be punishable under § 86a StGB. Argentine Marxist revolutionary, physician, author, guerrilla leader, diplomat, military theorist and a major figure of the Cuban Revolution. Captured during a 1967 campaign in Bolivia, he was executed on the following day and instantly attained status as a martyr and one of the most revered and influential political revolutionaries of the 20th century. Partly-printed document signed “Che”. 1p., 8.25 x 12.75 inch, September 15, 1964. Cuban Ministry of Industries vacation request document, approved at the conclusion by Guevara. In very good condition, with folds, creasing and tears to the edges. Che's signature is clear and unaffected. Guevara was at the very top of Castro’s government when this document was signed, serving not only as minister of industries but as president of the Cuban National Bank. Despite his high status, the activist in Guevara disliked his official duties - leading him to dismissively and diminutively sign solely as "Che" in his governmental capacities. A prominent politician in Nazi Germany. Appointed Deputy Führer to Adolf Hitler in 1933, he served in this position until 1941, when he flew solo to Scotland in an attempt to negotiate peace with the United Kingdom during World War II. Typed letter signed “Rudolf Hess”. 1p, 8.75 x 7.5 inch, on his personal “Rudolf Hess München Harlaching” stationery. Munich, 1934 January 16. Signed in dark black ink by Hess with a rare full signature. Addressed to Lieselotte Kreisel-Kaestle, wife of the art historian Heinrich Kreisel (1898-1975). In German, in full: „Infolge sehr vieler Post recht nachträglich danke ich Ihnen für Ihre seinerzeitigen Glückwünsche, über die ich mich in Erinnerung an das Zusammensein Ende des Kriegs und in der ersten Kampfzeit hinterher herzlich freute. Ich hoffe, dass doch bald einmal die längst gehegte Absicht verwirklicht werden kann, Sie und die Ihren bei uns zu sehen.“ Translated: „As a result of a great deal of mail, I thank you very much for your congratulations at the time, which I gladly rejoiced in remembrance of the end of the war together and in the first fight time. I hope that soon the long-cherished intention of seeing you and yours with us can be realized.” Heinrich Kreisel was museum director (Ludwig II. - Museum Herrenchiemsee) and general curator of the Bavarian State Office for the Preservation of Monuments. He wrote the book "Munich" in 1934. Mailing folds, else fine condition. Note: We reject Nazism in any form! Nevertheless we offer autographs of this kind, because it is an important part of the history of the 20th Century. To the extent applicable to those affected by German law, particularly § 86a StGB, historical and military items from or relating to the period and personalities of the German Third Reich are offered for only purposes of education and research regarding historical events and military history. Clients who purchase such items agree that they will not use them for propaganda or other purposes that would be punishable under § 86a StGB. A prominent politician in Nazi Germany. Appointed Deputy Führer to Adolf Hitler in 1933, he served in this position until 1941, when he flew solo to Scotland in an attempt to negotiate peace with the United Kingdom during World War II. Typed letter signed “R.Hess”. 2pp., 8.5 x 11.5 inch, on “Kanzlei von Adolf Hitler, München” stationery. Munich, 1927 April 12, signed in pencil. Addressed to Eugen Munder in Stuttgart regarding Hitler’s speech. In German, in full: „Herr Hitler will keinesfalls in zwei Sälen sprechen. Ich verweise hierbei auf meinen letzten Brief, in dem ich Ihnen mitteilte, wie schonungsbedürftig die Stimme Herrn Hitlers ist. Sich in einem Saal nur zu zeigen und ein paar Sätze zu sprechen, dazu will Herr Hitler sich nicht hergeben; er kann es auch garnicht, bei allen guten Vorsätzen, spricht er dann im zweiten Saal doch wieder zu lange und das Ergebnis ist ein weiterer Stimmenknaks. Wenn es also nicht gelingt, doch noch die Liederhalle zu bekommen, müssen Sie sich mit dem Dinkelackersaalbau begnügen. Ob Sie Herrn Dr. Goebbels in einem anderen Saal noch sprechen lassen wollen, ist natürlich Ihre Angelegenheit, hinkommen wird Herr Hitler keinesfalls. Ich nahm davon Kenntnis, dass die Daten in einem Ihrer letzten Briefe (6. und 7. Mai) ein Irrtum sind und dass die Veranstaltungen am 7. und 8. Mai stattfinden. Wiederum mit Rücksicht auf die Stimme - Herr Hitler möchte nach dem Vortrag auch nicht im kleinen Kreise sprechen oder sich unterhalten - zieht Herr Hitler Quartier in einem Hotel vor. Sie erhalten dieserhalb noch Nachricht. -In Herrn Hitlers Begleitung werde ich mich befinden, der mit Herrn Hitler zusammenwohnt, weiter werden den voraussichtlich Hauptmann von Pfeffer, Maurice und Schreck dabei sein, für die Privatquartiere bereits bestellt werden können. Vortragsbestätigung anbei. N.S. Soeben sprach ich mit Herrn Hitler nochmals wegen der Quartierfrage: Herr Hitler würde eine Einladung Prof. Waldschmidt’s mit Dank annehmen unter der Voraussetzung, dass er bestimmt nicht zur Last fällt und seinerseits nach dem Vortrag keine Rücksichten zu nehmen braucht, d.h. nicht in grösserem Kreis zu verweilen braucht.“ Mailing folds, punch holes, slightly trimmed, paper-clip impression, minor fold break, else good condition. Note: We reject Nazism in any form! 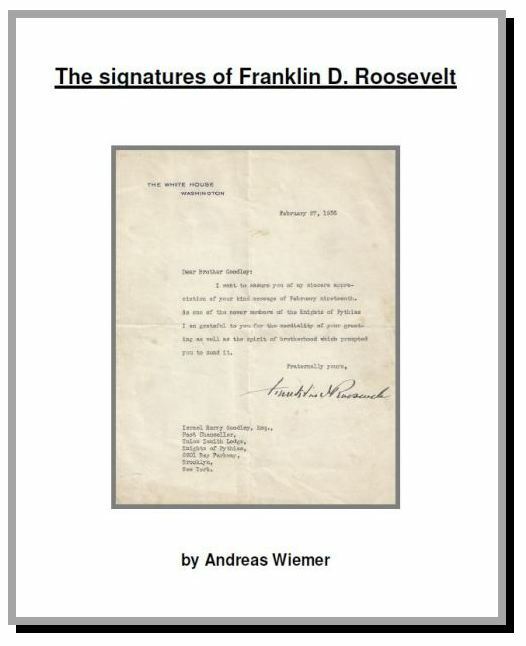 Nevertheless we offer autographs of this kind, because it is an important part of the history of the 20th Century. To the extent applicable to those affected by German law, particularly § 86a StGB, historical and military items from or relating to the period and personalities of the German Third Reich are offered for only purposes of education and research regarding historical events and military history. Clients who purchase such items agree that they will not use them for propaganda or other purposes that would be punishable under § 86a StGB. Liberal German politician who served as the first President of the Federal Republic of Germany (then West Germany) from 1949 to 1959. 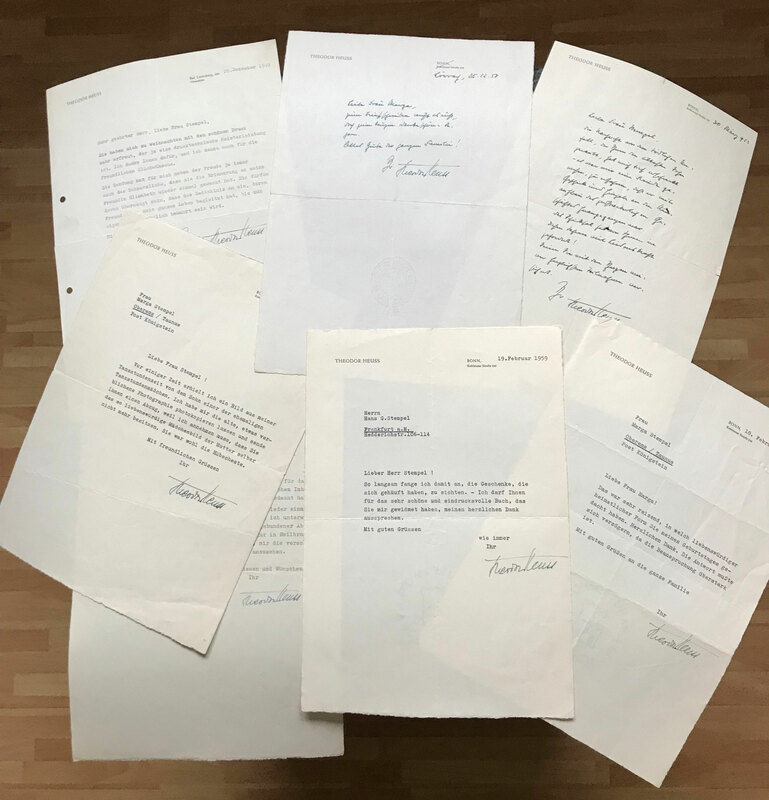 Excellent letter archive, two autograph letter signed and five typed letter signed. All on “Theodor Heuss” stationery, 8.25 x 11.75 inch, fine laid paper. Addressed to Mrs. Marga Stempel in Oberems/ Taunus and to Mr. Hans G. Stempel in Frankfurt. Dated (1) 1949 December 28, (2) 1951 December 27, (3) 1953 March 30, (4) 1954 March 8, (5) 1958 December 25, (6) 1959 February 18, (7) 1959 February 19. Mailing folds, handling wear, else fine condition. Liberal German politician who served as the first President of the Federal Republic of Germany (then West Germany) from 1949 to 1959. 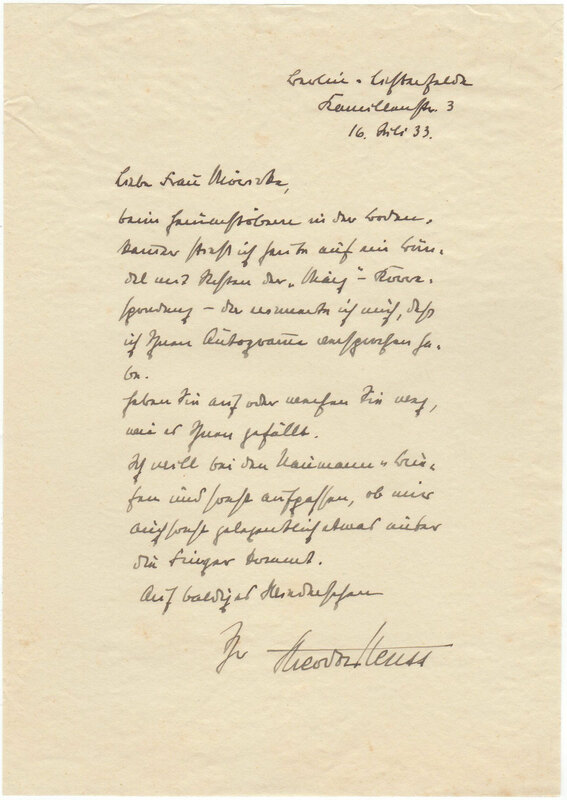 Autograph letter signed “Theodor Heuss”. 1p., 6.0 x 8.25 inch, Berlin-Lichtenfelde, 1933 July 16. To “Liebe Frau Möricke”. Untranslated letter in German. Minor handling wear, else fine. Austrian-born German politician who was the leader of the Nazi Party (German: Nationalsozialistische Deutsche Arbeiterpartei - NSDAP). He was chancellor of Germany from 1933 to 1945 and Führer (leader) of Nazi Germany from 1934 to 1945. Signed postcard-photo “Adolf Hitler”. 3.25 x 5.0 inch., n.p., n.d., signed in dark black ink. Lower margin titled "Der Führer in Rosenberg 20.X.1938". Photo shows Hitler in an open Mercedes, in the background the church tower of Rosenberg (Ruzovsky vrch/ Czech Republic). Fine condition. On October 20, Hitler drove from Linz to Bohemia and made a speech in Krumlov at 11 o'clock, the journey continued through Rosenberg. Note: We reject Nazism in any form! Nevertheless we offer autographs of this kind, because it is an important part of the history of the 20th Century. To the extent applicable to those affected by German law, particularly § 86a StGB, historical and military items from or relating to the period and personalities of the German Third Reich are offered for only purposes of education and research regarding historical events and military history. Clients who purchase such items agree that they will not use them for propaganda or other purposes that would be punishable under § 86a StGB. The fifth President of Iraq, serving in this capacity from 16 July 1979 until 9 April 2003. Document signed. 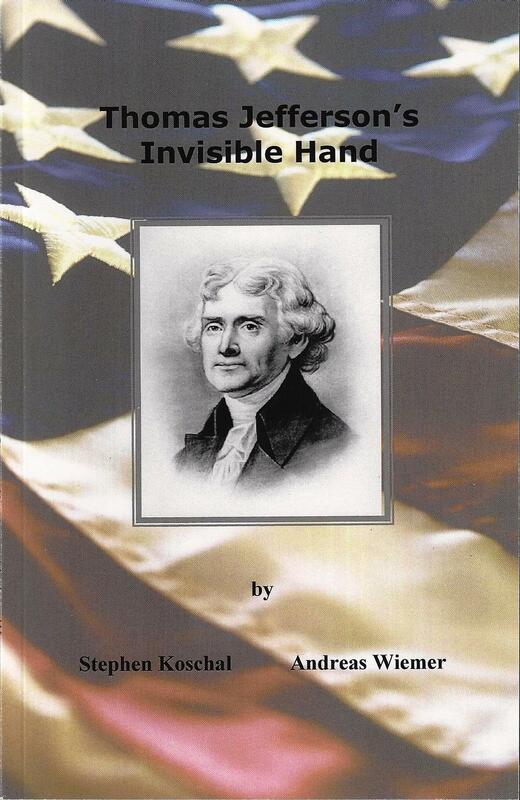 1p., 8.0 x 11.0 inch, n.p. (Baghdad), 1980 May 18, blind embossed national coat of arms at the top. Signed in red ink by Hussein as President of the Bath-Party. 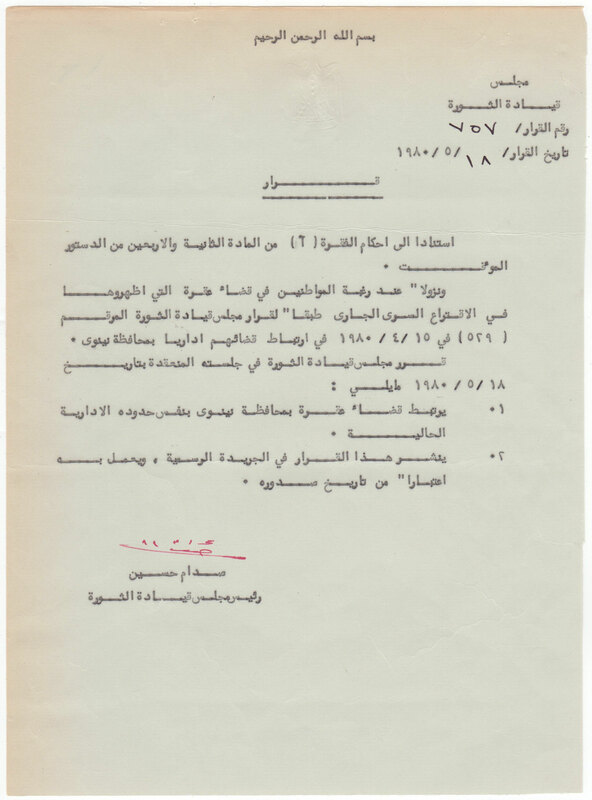 The document deals with the affiliation of a city that wants to belong to the district of Mossul. A German translation is included. Slightly discolored, else good condition. Born Karol Józef Wojtyła. Pope from 1978 to 2005. He is widely known to Catholics as Saint John Paul the Great. Signed and inscribed photograph. 7.75 x 9.75 inch photo on the original 11.0 x 14.75 inch photographers mount. N.p., 1980 May 12. Signed and inscribed by the Pope on the mount below his image “Al carissimo Mons. Justo Mullor Garcia nunzia apostolico in Abidjan Joannes Paulus PP. II”. Photograph by Yousuf Karsh and printed on verso No. 7, Karsh, Ottawa. “7” filled in by hand (pencil). Photograph shows also a printed signature of Karsh below the image of the Pope. Minor foxing and minimal scratches on the photograph, else good condition. 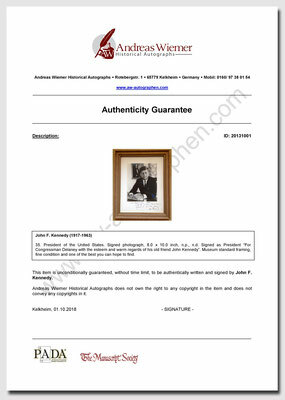 Signed photos of John Paul II. as Pope are rare and this one is surely one of the finest known to exist. Yousuf Karsh (1908-2002) was an Armenian-Canadian photographer best known for his portraits of notable individuals. He has been described as one of the greatest portrait photographers of the 20th century. Justo Mullor García (1932-2016) was a Roman Catholic archbishop. Mullor Garcia was ordained to the priesthood in 1954. From 1979 to 2000 he served as apostolic nuncio, then he served as President of the Pontifical Ecclesiastical Academy from 2000 to 2007. Born Karol Józef Wojtyła. Pope from 1978 to 2005. He is widely known to Catholics as Saint John Paul the Great. Typed letter signed “+ Karol card. Wojtyla”. 1p., 8.25 x 11.75 inch. Krakow, 1975 October 4. On Metropolita Krakowski stationery. In Polish, in full: “Drogi Ksieze Janie! Otrzymalem teksty pytan i odpowiedzi w chwili wyjazdu na wizytacje. Pytania sa inteligentne, ale nazbyt 'ciekawe', ida za daleko. Odpowiedzi - z koniecznosci - dyplomatyczne, a wiec wymijajace z Polski nie sfinalizujemy tego. Mysle, ze jesli warto im 'dac wywiad', to juz podejmujac sprawy nieco gruntowniej. Moze zreszta sie myle. W kazdym razie bardzo dziekuje za propozycje i serdecznie pozdrawiam.” Translated: “Dear Prince Janie! I received questions and answers at the time of my visit. Questions are smart, but too 'interesting', too far. Responses - of necessity - diplomatic, and so evading from Poland we do not finalize this. I think if it is worth giving them an interview then they are already doing things a little bit more thoroughly. Maybe I'm wrong. Anyway thank you very much for the suggestions and cordially.” Mailing folds, paper clip impression, else good condition. Born Karol Józef Wojtyła. Pope from 1978 to 2005. He is widely known to Catholics as Saint John Paul the Great. Typed document signed “+ Karol card. Wojtyla”. 1p., 8.25 x 6.0 inch. Krakow, 1978 June 10. On “Kuri Metropolitalna” letterhead, fine blind embossed seal at the bottom and signed shortly before he was elected Pope, his papacy began 1978, October 16. In Polish, in full: “Czcigodny Ksieze Proboszczu Uprzejmie zawiadamiam, ze Ks Adam Szostak na moje polecenie bedzie prowadzil rekolekcje wakacyjne Sluzby Liturgicznej w Waksmundzie od 3.8 do 19.08.1978.W zwiazku z tym prosze Ksiedza Proboszcza, by czas prowadzenia rekolekcji ni byl wliczany w urlop ksiedza rekolekcjonisty.” Translated: “Venerable Pastor I would like to inform you that Adam Adam Szostak will be conducting the holiday retreat of the Liturgical Service in Waksmundzie from August 3 to August 19, 1978. In connection with this, please visit the Rector's Office for the time of retreat.“ Mailing fold, else fine condition. Born Karol Józef Wojtyła. Pope from 1978 to 2005. He is widely known to Catholics as Saint John Paul the Great. Typed document signed “+ Karol card. Wojtyla”. 1p., 8.25 x 6.0 inch. Krakow, 1978 June 10. On “Kuri Metropolitalna” letterhead, fine blind embossed seal at the bottom and signed shortly before he was elected Pope, his papacy began 1978, October 16. In Polish, in full: “Czcigodny Ksieze Proboszczu Uprzejmie zawiadamiam, ze Ks Andrzej Trzop na moje polecenie bedzie prowadzil rekolekcje wakacyjne Sluzby Liturgicznej w Krzeszowie od 3.8 do 19.08.1978.W zwiazku z tym prosze Ksiedza Proboszcza, by czas prowadzenia rekolekcji ni byl wliczany w urlop ksiedza rekolekcjonisty.” Translated: “Venerable Pastor I would like to inform you that Adam Adam Szostak will be conducting the holiday retreat of the Liturgical Service in Krzeszowie from August 3 to August 19, 1978. In connection with this, please visit the Rector's Office for the time of retreat.“ Mailing fold, else fine condition.